Let’s face it. Accidents happen, especially around the holiday season as the excitement of holiday gatherings and Christmas cheer fill the air. Don’t fret about those embarrassing stains and spills this year. Get Out Spot! 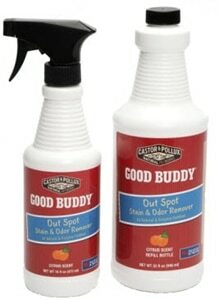 Stain and Odor Remover by Castor & Pollux. Out Spot! is specifically designed to remove the toughest stains and odors from a wide variety of surfaces including carpets, rugs, clothing, tile, upholstery, numerous fabrics, concrete, metal, and even wood! Natural enzymes work hard at removing stains and odors caused from such things as feces, urine, mildew, vomit, coffee, tea, and even red wine! It is composed of several ingredients such as Natural Enzymes, Vinyl Porcelain, Propylene Glycol, Water, Natural Citrus Fragrance, and Coconut Oil-derived Surfactants. These ingredients are stimulated for multiple uses. Out Spot! is available in two sizes for added convenience! Try a smaller 16 oz. bottle for your vehicle or boat, and buy the larger 32 oz. bottle for your home and office needs! Never worry about holiday spills again! Order yours today!